My Paradise – Pike on the Fly Will the Bass turn up this weekend? After one of my best fishing sessions I’ve had in a long while the other weekend, it was nice to plan a fishing trip without putting too much pressure on myself. 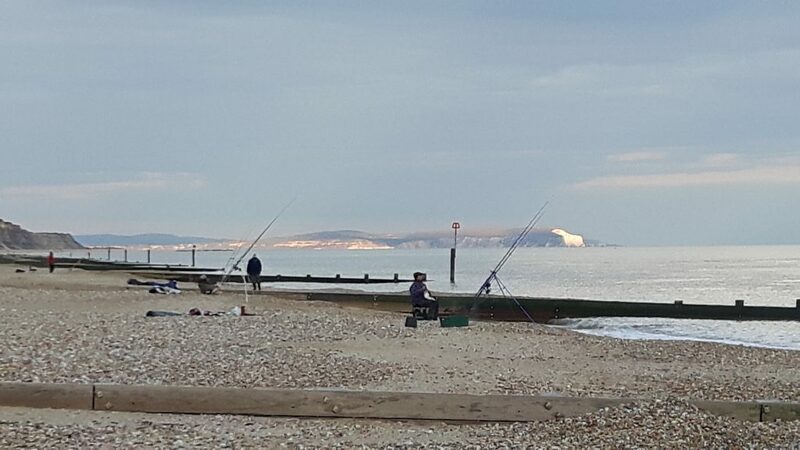 With that in mind I set off to Southbourne with three rods and two bags of frozen mackerel determined to catch myself a turbot. I fished one in close on long flowing rigs. A third casting in between the other two with a plain lead allowing it to roll around covering lots of ground. Seeking out those fish holding gulley and holes. Long story short I never had a sniff from a turbot or any other fish until slack water at midnight when the dogs came on the feed. At that point I knew it was definitely time to pack up. I wasn’t too disheartened, I had tried for a new species so I don’t expect results overnight. It takes time and a few man hours on the beach to learn what are the best tides weather and bait etc! All of which, as always, goes into my little black book. 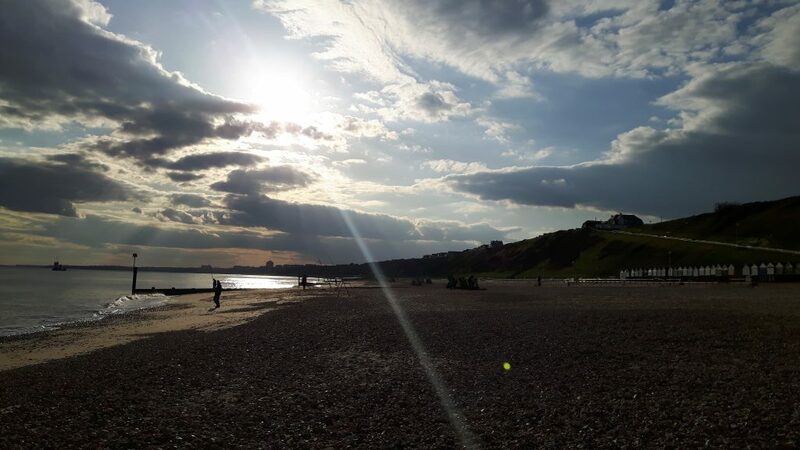 Whilst I was fishing I also enjoyed one of Southbourne’s added bonuses. The sunsets down there can be stunning, so it was nice to kick back and soak up nature’s spectacle and just chill out. It was that or “Britain’s got Talent” I know which one I would choose every time! In the lead up to the bank holiday the weather hadn’t looked great and in order to earn some much needed brownie points I had agreed to do some bank holiday jobs around the house. By midday Saturday I had finished all my chores, I raced down to the beach and dug a few worms for a couple of hours plaice fishing at Sandbanks. By 1 pm I was just casting out the first rod of the session. The beach was packed with dog walkers and families enjoying the early season sun but I selected a quietish spot between the groins to setup. I always bring my dog “scooby” with me when I go fishing so I know the problems associated with dogs and anglers. I keep my bait covered up and any hooks or weights,knives or any other dangerous items stowed away so he wont hurt himself on any of it and my dog is well trained enough that I can trust him not to do anything stupid when my back is turned. That way no dog walker feels he has the right to be lecturing me on fishing around their dogs. Imagine my disgust when, after returning to my seat box after casting out, I find the seat cushion was soaked in dog pee. I knew it wasn’t my dogs as he can’t get his leg up that high! Looking around for the offending dog or owner nobody owned up or apologised. It just go to show the lack of control and respect that some dog owners have for the rest of the beach users. That was enough for me and I moved my base camp up to the end of one of the long stone groynes. (that was after I had washed all my kit in the sea). As well as being out the way of all the dogs, being on the end of the groyne gives me a few extra yards casting distance. 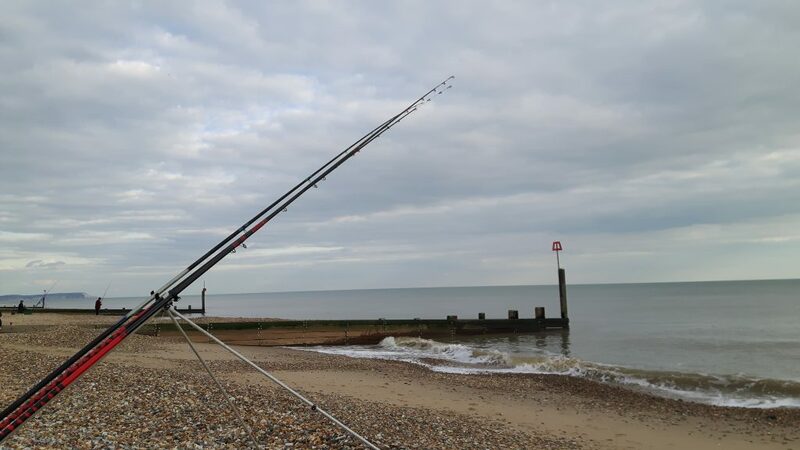 Two rigs baited with lug and rag went out as far as I could get them and one at the end of the groyne. 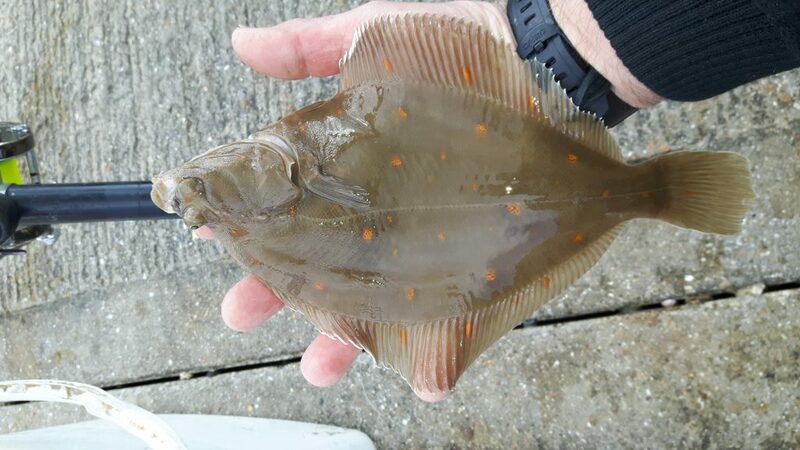 For the first time in a long time water visibility/clarity was very clear and ideal for plaice. It’s just a shame the tides and weather weren’t.. Warm sunny spells in between heavy sleet and hail showers were still a sign summer is not quite here yet. Nevertheless it was pleasant when the sun came out. Now all I needed was a plaice. High water came and went! Usually the time I would expect to see a flattie. Another hour went by and I resigned myself to just enjoying the weather as it looked like the plaice weren’t going to play ball! Reeling in to rebait one of the distance rods I felt a little tug and a slight resistance on the end of the the line. In the clear water I could see a perfectly formed small plaice on the end of my line. Target species accounted for! About thirty minutes later I had another plaice slightly larger closer in. In a short session I had set out to catch a plaice and that is exactly what I had done! It’s just a shame I didn’t get any of the six pounders that I know Sandbanks can produce. 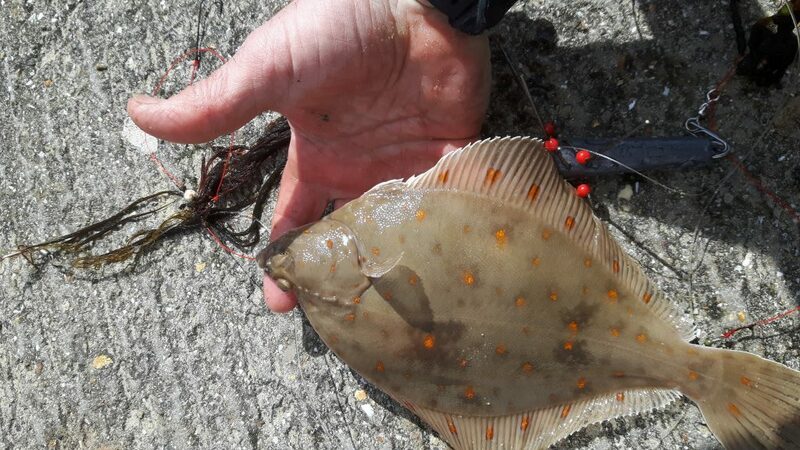 Rays are still being caught on all the local marks and we are starting to see a trickle of summer species being caught too. One of which is the black bream. These fish punch well above their weight and can be caught on worm, mackerel, squid or shellfish baits. In the past through the summer, bream have been caught off the groynes at Sandbanks and any scrub ground off of Southbourne’s shores. Milford shingle bank is another good area to fish for them. They don’t require any specialist tackle and are very often caught whilst targeting other species. 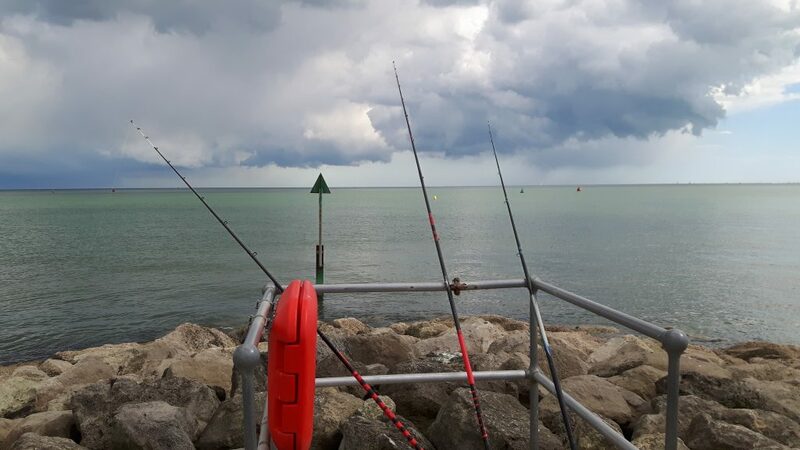 The best fishing I have had for them is on the boats off of Bournemouth using light spinning tackle and 6lb braid is the best fun I have ever had catching these scrappy little fighters. Many charter boats from Poole offer specific trips for bream with 4,6 or 8 hour trips depending on your budget. Check the out the local tackle shops for more details on charters. Early indications are that mullet are showing in and around the harbour too. It won’t be long before I will be free lining a bit of crust off the edge of the quay in the evenings. With the long summer nights. I will be offering guiding trips throughout the week in the evenings as well as guiding trips Saturday days or nights. Any species catered for. One Response to "Sandbank’s the plaice to pee"
Quality reporting , thanks , covering the marks I fish . Dogs do my head in on the beach and are a danger to themselves and a nuisance to anglers , shame owners let them run wild around anglers . Its good to remind oneself that a chesil trip is not always needed for a plaice .